MaintenX shared industry-leading insights on maintenance and roofing with conference attendees. MaintenX employees Angela Bartoli and Luis Alfaro share the many benefits facility managers gain from using MaintenX for their roofing needs. A roof is one the major lines of defense for keeping your building safe and dry. Our team provides the peace of mind that comes with knowing your roof is strong and well cared-for. It’s easy to underappreciate the work necessary to keep buildings running safely and efficiently. However, for facility management, engineers and maintenance crews, it’s a daily consideration. 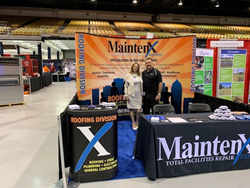 MaintenX International, one of the nation’s largest providers of facility maintenance services, attended the 12th Annual Florida Building Engineering & Facility Maintenance (FB-FM) Show this week to provide attendees industry-leading perspective on roof maintenance and repair. Held April 3rd at the Florida State Fairgrounds in Tampa, Fla., The FB-FM Show provided unique opportunities to shop, network and learn more about current facility management best practice and trends. MaintenX is an approved applicator for a range of roofing manufacturers, including household names like General Electric, Carlisle and Firestone. They are also an active member of the National Roofing Contractors Association (NRCA) and the Florida Roofing and Sheet Metal Contractors Association (FRSA). Facility managers trust MaintenX because their technicians have provided exceptional maintenance services for more than 40 years, and Roofing Division managers have more than 85 years of combined roofing experience. To learn more about MaintenX or to schedule a roof inspection or repair, visit http://www.maintenx.com.